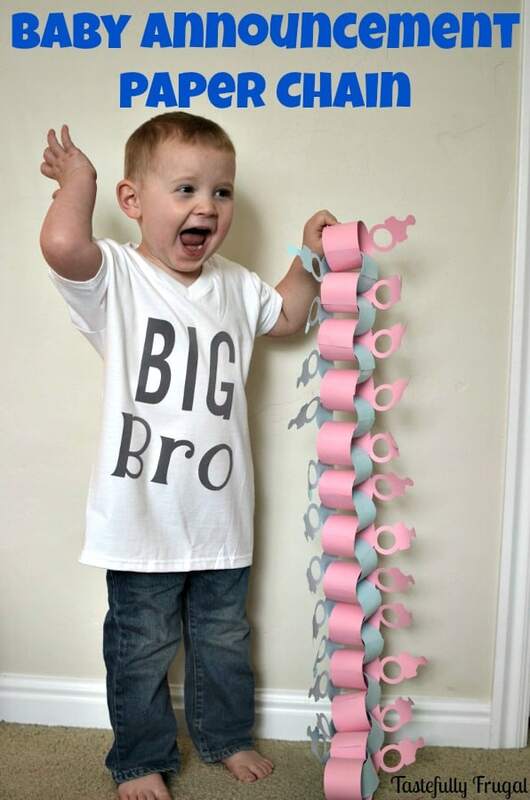 Countdown to baby with this easy to make paper chain. You’ve probably noticed I have been a little absent around here lately. Well there’s a good reason…We’re excited to announce we are expecting our 3rd baby this fall! So far things have been great, other than my lack of energy and motivation to do anything, but I’ll take 100 more of these days to have a healthy baby. We haven’t told many people, in fact only family and friends who have seen me know I’m pregnant because, well because it looks like there is a basketball under my shirt as my two year old puts it. Both my boys are excited to be big brothers (again) and have been asking on a daily basis “Is the baby coming today?” They don’t really understand the idea of waiting 9 months for anything let alone their new best buddy to come so I decided to make a fun little countdown for them. 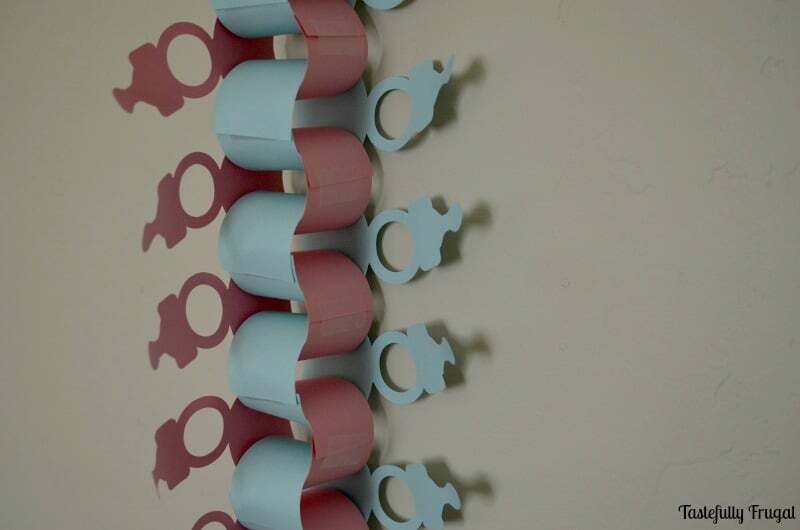 This paper chain was so easy to make thanks to my Cricut Explore Air. I created this design with enough paper to make the chain and a cute little pacifier attached and then just used tape to connect the pieces. I’m 15 weeks along so we did 25 chains, one for every week we have left until the due date. You can make one as soon as you find out your expecting, or after you find out if you’re having a boy or girl or whenever you’d like. Since we don’t know if we’re having a boy or girl yet I used both pink and blue paper. I found this pack of Dreamy cardstock at Michael’s for $3 and the colors were perfect! We hung this up in our boys’ room and every Sunday they get to take one piece off. Now they have an visual idea of how much longer until baby comes. I also made that Big Bro shirt with my Explore Air and more pictures of the other shirts and a few pictures of mommy and baby are coming later this week so keep an eye on Instagram for those. 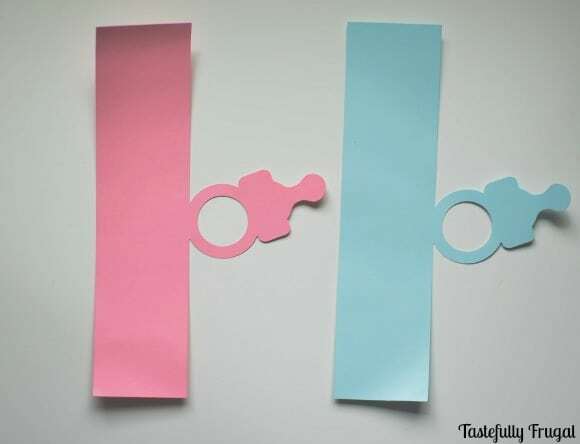 And check back later in the month for some fun gender reveal party ideas too! Are you expecting? How have you been feeling? Any strange cravings? What a cute idea for your kids to “help” with the wait of the pregnancy. I’m expecting our first baby, so I can hardly wait for this one… then to let them know about the other future babies too haha! I just wanted to say your instructions where right on point.